The VeriFone CR 1000i can be cost-effectively integrated into virtually any retail environment. The device's optional dual interface is designed to connect to an electronic cash register (ECR) and to your store's Ethernet network, for efficient back-end processing. This makes it a snap to use the VeriFone CR 1000i as a drop-in replacement for an existing MICR-only check reader in a legacy POS environment - with less cost and complexity than other check conversion alternatives. The VeriFone CR 1000i check and document reader offers multi-lane retailers an easy and efficient way to take advantage of the wide-ranging benefits of check conversion and check imaging at the point of sale (POS). With the CR 1000i, you can quickly and conveniently convert paper checks into secure electronic documents - greatly reducing your cost of handling, processing and collecting checks. Single-step check reading and image compression With the VeriFone CR 1000i, check conversion and imaging are accomplished in a single step. The clerk simply feeds a check into the device, where a contact image sensor captures a 300dpi (dot per inch) black-and-white image of the key elements of the check, including name and address, bank information and signature line. The CR1000i can be programmed to read the MICR line once- or twice for improved accuracy. Within seconds, an ECR-generated authorization slip is ready for the customer's signature. Once the device has captured the needed information, all other check-related tasks - such as sorting, Proof of Deposit (POD) and bank processing - are handled electronically. 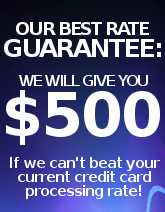 This can significantly lower your bank deposit charges, month after month. 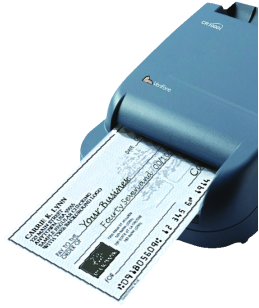 The VeriFone CR 1000i uses three different intelligent imaging algorithms to reduce the size of the check image data. These capabilities eliminate unnecessary background images, target the key quadrants of the check, and then apply industry - standard compression techniques to make the data easier to store and transmit. The compact, stylish design of the VeriFone CR 1000i check and document reader requires minimal counter space. System updates can be downloaded remotely, to protect your investment over time. In addition, the CR 1000i benefits from the unmatched technology, reliability and application expertise of VeriFone - the leader in e-payment.